Deltarune is a strange little RPG which is loosely connected to Undertale, another strange little RPG from developer Toby Fox which lit the world on fire in 2015. Deltarune was first revealed last October, but its first chapter, which serves as a free demo for the full game (which will not be free), is just now making its way to consoles this month. It was recently confirmed for Nintendo Switch (along with a bunch of other stuff), and as the official PlayStation Twitter announced today, it's also coming to PS4 on Thursday, February 28. If you've played Undertale, Deltarune will look and feel familiar. At first blush, it's a turn-based RPG with some cute pixel art, but there's also a lot of weird, off-the-wall stuff going on. 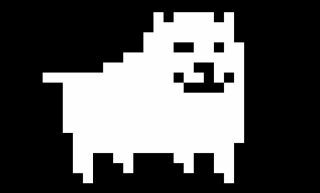 If you haven't played Undertale, you really should, both because it's a great game and because Deltarune is squarely targeted at Undertale veterans. It's not a sequel, though - in fact, it's not even set in the same world as Undertale. It's complicated. In a Twitlonger post from last year, Fox explained that "Deltarune's world is a different one" from Undertale's with "different characters that have lived different lives." It is, for all intents and purposes, "a game you can play after you complete Undertale, if you want to." Thinking about it, I suppose that describes rather a few games. Oh, and there's no telling when the next chapter will be released. "Making the demo of Deltarune took a few years," Fox said. "So, given the length of the rest of the game, and how long I'd be willing to spend on a project (seven years maximum) I think the answer is that it's actually impossible to make this game … However, it might be possible to create the game if I'm able to make a team. So I'm going to try making a team. Because I really want to make this. But I may not be able to succeed because I have no experience successfully directing a team and I have no idea who I'm going to work with. Since I haven't started assembling the team yet I have absolutely no estimation of its completion. It could take up to 999 years depending on the efficiency level." By Fox's estimation, the final release of Deltarune "might be on PlayStation 14 or something," which doesn't so much answer the question as create a dozen more. In any case, you'll be able to sample Deltarune, whatever the hell it is, on February 28 on PS4. Undertale earned a spot on our list of the best RPG games to over-invest in emotionally.